Christopher Ford, left, and Daniel Jacky will present a free concert Sunday, Aug. 19 at St. Mary’s Episcopal Church in Hillsboro. 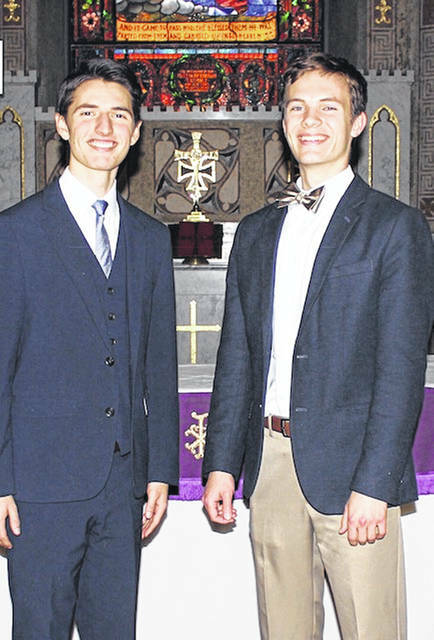 Hillsboro High School graduates Daniel Jacky and Christopher Ford will present a concert at 3 p.m. Sunday, Aug. 19 at St. Mary’s Episcopal Church in Hillsboro before they head back to college that will be free and open to the public. The two friends are no strangers to the community. They have performed for various events in Highland County for most of their lives. Ford will be attending Miami University and Jacky will be attendoing Oberlin College. Both are music majors. “We want to present a special concert for the people who have supported us over the years,” Ford and Jacky said. There will be a variety of music presented that should appeal to everyone. “Please come out and enjoy an afternoon of music,” Ford and Jacky said. Light refreshments will be served after the concert. Submitted by the Ford family. https://www.timesgazette.com/wp-content/uploads/sites/33/2018/08/web1_Ford-Jacke-pic.jpg.jpgChristopher Ford, left, and Daniel Jacky will present a free concert Sunday, Aug. 19 at St. Mary’s Episcopal Church in Hillsboro.